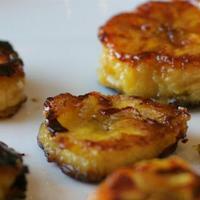 The humble plantain seems to be one of the most misunderstood fruits in the grocery aisle. Most people pass over these green bananas in favor of their more popular yellow cousins, yet they are wonderful to cook with. Treat them just like a potato and boil, fry, or mash them for a slightly unique experience. This recipe is very simple, quick and easy and produces a slightly exotic, yet somehow familiar appetizer. The caramelized honey and sea salt blend wonderfully with just a hint of banana. Warm a few tablespoons of olive oil in a frying pan over medium heat - enough to cover the bottom of the pan. When the oil is hot, sprinkle in a few pinches of sea salt. Cut the plantains about 1/2" thick and place in the oil. Add a drop or two of honey to the top of each one. Cook over medium heat, flipping a few times until nice and brown. Be careful - the honey will carmelize quickly after the first flip. I think kids will like this. This came out better than what I thought. The combination of salt and honey gives it an exquisite taste. I think I used too much honey but it still tastes great. Okay - this recipe looks awesome! Will definitely try for my next party. Great looking appetizer. Thanks Sean.